It was 1996 on the campus of a university still dusting itself off from a massive earthquake that struck two years earlier. And Parag Vaish ’97 (Finance) had to find a way. Based off numbers he had gathered, he knew voter turnout among students at California State University, Northridge for Associated Students government elections was generally low. So he, running for vice president, and Vladimir Cerna, running for president, got clever. The Deaf Studies Association on campus, he recalled, was largely ignored because of a communication barrier. However, data showed that the members of the group were generally active voters. Thus, Vaish broke the barrier and campaigned to the overlooked students. Vaish also recognized that students weren’t voting in numbers because of one of the requirements for voting. They had to provide pin numbers that were assigned to them months before as a requirement for registering for classes. After registration, they tossed or tucked the pin numbers away. The Cerna-Vaish ticket decided to knock on doors at university dorms, encouraging students to find their pin numbers, vote and vote for them. Then the duo took it a step further. It’s called resiliency — not facing a challenge but doing what it takes to overcome it. It’s one of the biggest takeaways Vaish said he has from his time at CSUN. And it’s a characteristic that has pushed him to great heights through leadership roles at The Walt Disney Company, Microsoft, NBC News, StubHub and in his current role with one of the most innovative companies in the world as digital products lead at Tesla. There is passion that stirs inside of Vaish when thinking about his time at CSUN. He had roots in the university. 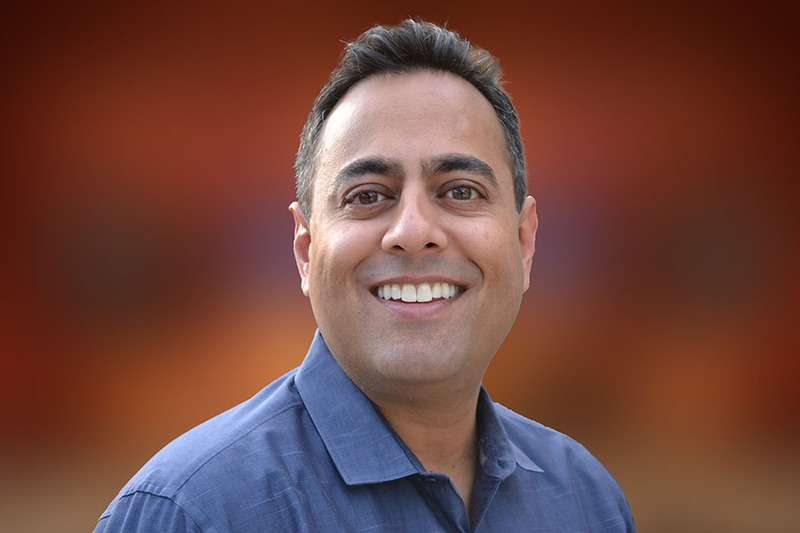 His sister, Aparna Singhal (who is now the director of global retail operations for Google Play), earned a bachelor’s degree in engineering from CSUN in 1991. His father, Harish Vaish, was a professor at CSUN. The university also provided opportunity for Vaish to find a way. Student government, he said, unlocked something in him. “I was a pretty shy kid going into college, and having to campaign and get in front of an audience and explain why you’re credible and qualified for this particular role develops character because you have to answer questions on the fly,” Vaish said. Fast forward 20 years and the skills he began to develop at CSUN helped when he answered questions during a live interview on Fox Business News explaining how one can purchase tickets through the StubHub app on the Apple Watch. “I learned how to think quickly on my feet, especially when in front of a live audience. I had no idea that would come in handy on live television 20 years later,” Vaish said. Tenacity, hard work, having foresight and transferring skills across different business landscapes are other ways that Vaish has found a way throughout a dynamic career. Between his junior and senior years at CSUN, he competed with what he recalls as 150 people for an internship at Disney. He came into the interview armed with a zero-based budgeting plan that he implemented within the University Student Union Board of Directors, while others came in empty-handed, and made so much of an impression that he was hired. Over the last 20 years, Vaish has worked in entertainment, healthcare, advertising, commerce and the travel industry, with three distinct job classification roles — finance, marketing and product management. Vaish received considerable media attention at StubHub, where he was the director of mobile product management from 2013-2015 and oversaw the company’s digital products during an immense growth period in technology and user engagement by leading the company into the mobile era. After StubHub, he became vice president and general manager of Epocrates, one of the most downloaded and highly rated medical reference apps on the market. And from there, he took on a new role at Tesla. Vaish oversees a team of product managers, designers and content creators at Tesla with the goal of providing users with the most informative, innovative and captivating experience on the website, on mobile, in retail stores and inside the actual vehicle. Being a part of a company that has received so much attention for its advances in technology and sustainability is something that Vaish doesn’t take for granted. Learning from visionary and Tesla CEO Elon Musk, Vaish said, is one of the most rewarding aspects of the job. Change, finding a way — they’re thematic in Vaish’s professional journey. And if there’s a path to finding the way’s starting point, it’s in Northridge. Yes, the environment was the stage. But it takes a doer to bring things to life. Vaish continues to do at every stage of his life. And he has a motivation that burns inside and lifts him to do more.